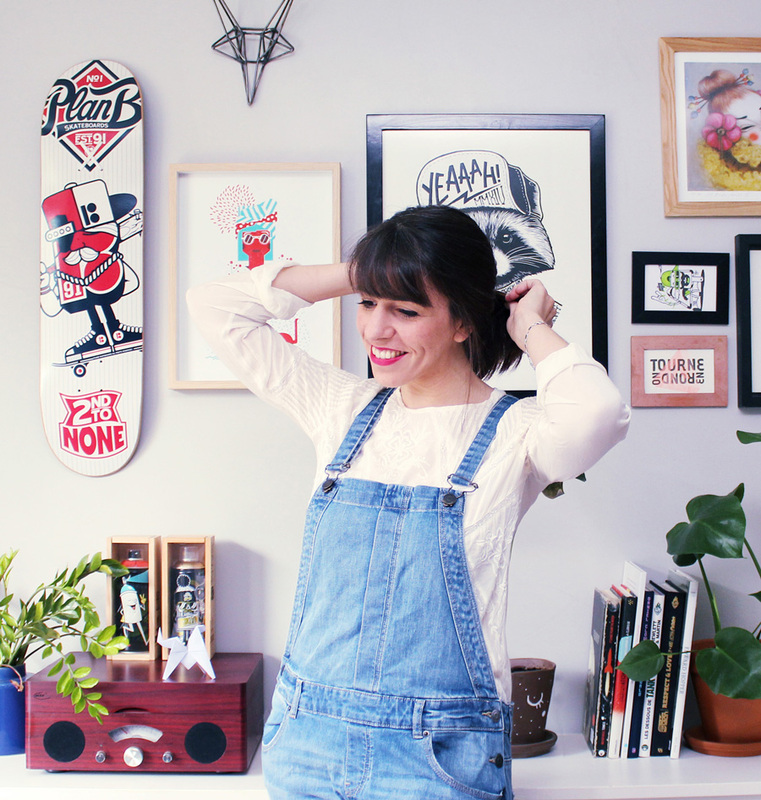 Maïté Franchi is an exciting emerging illustrator with a charming textured digital style. She brings a unique and creative perspective to each of her works. Vector, color, textures, flat, light. Pick three things that are most valuable to you in your studio and explain to us why you have chosen those, and what story there is behind them. My desk is quite minimalist; my apartment is a mess most of the time but my workspace has to be clean, it helps me to work and to focus! I keep a present from my dad, which he made – the metal fox right above my screen. My old tablet I bought during my studies, it’s used and cracked but I can’t change it, it’s like my old favorite pen! As well as broaches made by friends, that I used to wear almost everyday. You’re based in Lyon – in terms of influencing your work, what would you say is the most inspiring aspect of the city? Lyon is my new city, I left Paris last year and even if I still miss Paris, I love Lyon! I feel as if I am on holiday everyday. I left my full-time job after a week spent here and I do not regret it. The atmosphere is very relaxed, there are a lot of galleries, associations, artist ateliers, and creative markets. The city has different “quartiers” which have different styles. Everything is easier, you can ride your bike all over the city, go to the park, have brunch with friends, visit a museum, go snowboarding on the weekend, or just take a walk in the city and catch some new street artists. What do you do when you first approach an illustration? As soon as I have the brief or get an idea, I write comments, ideas and sketches on paper before turning on my computer. I turn on music or take a walk with my dog, trying to stay away from my computer until I get my idea. Then I make sketches, and according to the opinion of the client, I develop the proposal held until the final result. Each new project is challenging. I feel nervous and excited every time; I hope never to lose this feeling! The most difficult thing is when a client asks to work with a particular colour, as I’m obsessed with blue! I feel lucky! I can focus on what I love to do the most. Negotiations take a lot of time and energy, and actually, I don’t like it very much. Folio make me feel like a professional; I’m very proud actually, by telling clients “you can contact Folio”! Folio helps me to choose projects and brings me job I never could get, too. I was contacted at the right time, having just left my job in Paris, and it couldn’t have been more perfect. You predominately work in digital and vector, have you tried experimenting with styles and other working methods? I like working on parallel projects when I can. I like trying new mediums with no computer. I built a screen-printing workshop in my garage and a part of my bathroom. This medium helps me to think differently, to look at the subject in a different light. You have to keep it simple, to go to the simplest shape with 2 or 3 colors – its a good exercise. If you could pick any artist or illustrator to make a collaborative piece, who would it be? It’s such a difficult question! I love the collective 123Klan; their works are bold, fresh and impactful, using spray as vector. I’m a big fan. I knit when I watch movies, run, glue up big drawings in the streets, drink wine with friends, go the galleries, travel when I can, and buy plants (I have to stop the jungle here).